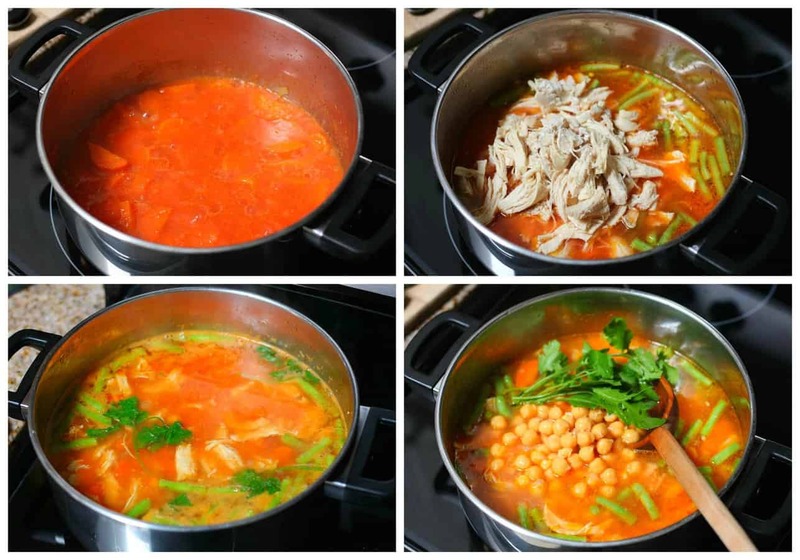 Caldo Tlalpeño is a delightful and nutritious soup made with chicken, carrots, chickpeas, and green beans. It is usually garnished with avocado and cheese and served with a Chipotle pepper on the side. 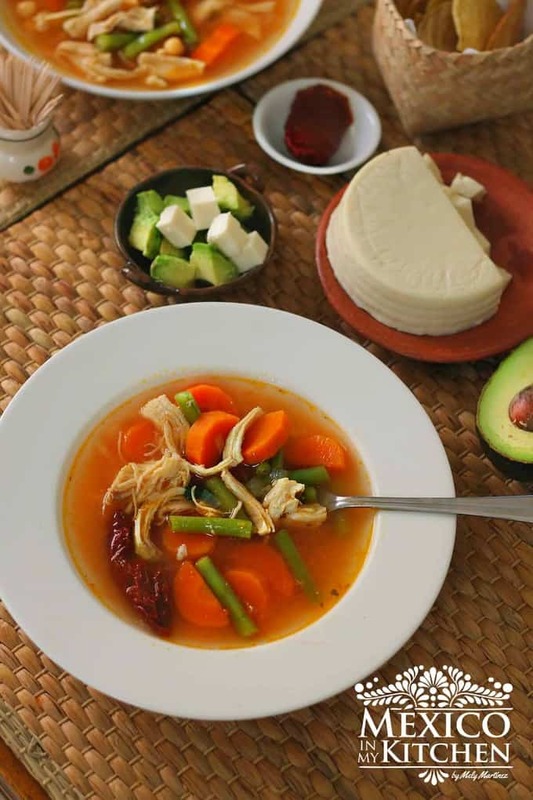 This soup is very popular at many restaurants in Mexico, and is found in small eateries as well as in chain restaurants. Diner chains like Toks, VIPS, and El Porton have long offered Caldo Tlalpeño on their menus alongside other favorites like Tortilla Soup, Chicken Soup, and Chicken Consommé. The vegetables added to this Tlalpeño Soup vary depending on the cook. You can find some very easy recipes with only the chicken, chickpeas, and carrots, but there are more complex versions that include squash, potatoes, green beans, rice, xoconostle, and epazote. Epazote is one of the key ingredients of this soup. It has a strong flavor, and it is used when cooking black beans because it is believed to reduce the effects of consuming black beans (gas). 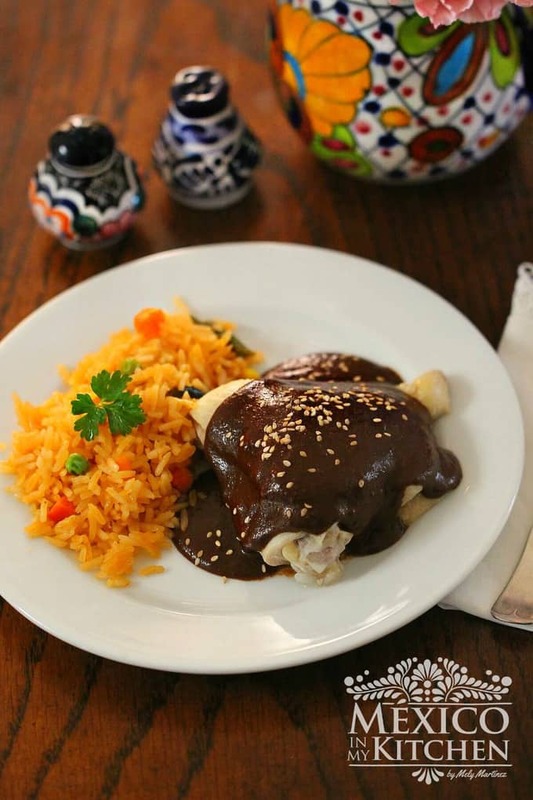 It is also used to flavor other very traditional dishes from Central Mexico, like quesadillas, entomatadas, chilaquiles, and seafood soups. If you can’t find epazote where you live, use cilantro in its place for this recipe. Caldo Tlalpeño is served with shredded chicken or with pieces of chicken with the bone in them. It can be served as a main meal in a large bowl or in a small bowl to accompany an entree. 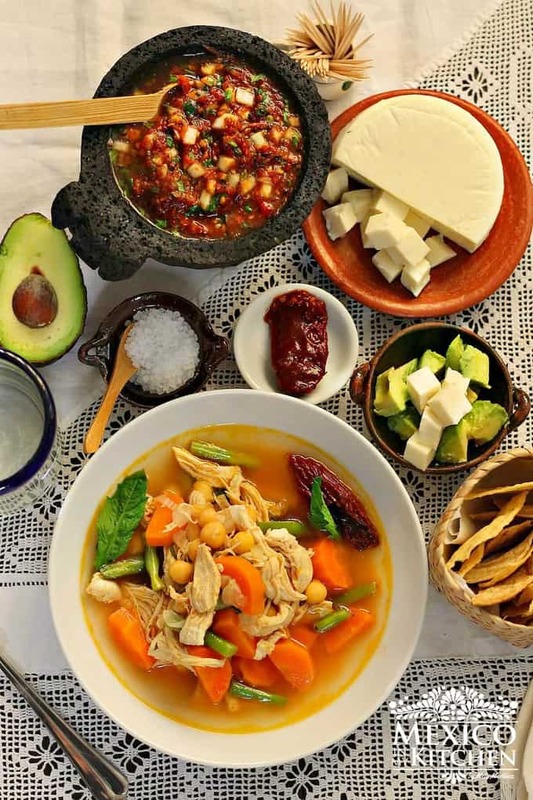 The name “Caldo Tlalpeño” indicates that the soup is from a place called “Tlalpan”, but there are several regions that claim to be the place where the soup originated, as well as several stories explaining how it came to be. One of the most common stories takes place in the 19th century in the town of San Agustín de las Cuevas, which is now known as Tlalpan and is part of Mexico City. Most towns have a festival for their patron saint, and San Agustín de las Cuevas was famous for its rambunctious festivities. One day, after many days of gambling, partying, and drinking, Antonio López de Santa Anna, the President of Mexico, woke up in his holiday house in Tlalpan with a terrible hangover. He asked the cook to prepare something to reinvigorate him, so she made a chicken soup with vegetables, epazote, and chipotle. Overwhelmingly pleased with this delicious soup, Santa Anna asked the cook what its name was, to which she responded: “Caldo Tlalpeño”. Other soups with chicken: Chicken Soup, Tortilla Soup, Fideo with chicken soup. Another story takes place in the early 20th century, where tranvías (trolley cars) were a popular form of public transport in Mexico City. The tram station in Tlalpan was known for its food vendors. Most of them sold antojitos, but one vendor became known for his special way of making soup, which included chipotle, cheese, avocado, and other vegetables. This soup became known as “Caldo de Tlalpan”, which was later shortened to “Caldo Tlalpeño”. Regardless of which origin story is true, Caldo Tlalpeño is now a staple of the restaurants in the Tlalpan area of Mexico City, and has become a favorite soup in diners all over the country. When making your Caldo Tlalpeño, you can make things easier for yourself by cooking the chicken ahead of time using your slow cooker, pressure cooker, or instant pot. I personally like to cook it the old-fashioned way, on a pot on my stove. I should also mention that this soup freezes well if you want to store it for later. This makes it the perfect soup if you’re on a diet: it’s delicious, healthy, and convenient! Usually, 1 chipotle pepper is used per serving, but I have only included 2 peppers for this 4-serving recipe because I figure a half pepper will be enough heat for most people. Feel free to add more peppers if you like! To cook the chicken, place it in a stockpot with the onion and garlic clove, then cover it with the water and season with 1 tsp. of salt. You can also add parsley, cilantro, and celery to add more flavors to the chicken broth. Cover the stockpot and bring to a boil over high heat. Once the chicken has come to a boil, reduce the heat to simmer. Cook for about 45 minutes until the chicken is tender and easy to shred. Once the chicken is cooked, strain the chicken broth and set it aside to cool separately. Shred the chicken (when it is cool enough to handle) and set aside. Heat the oil at medium heat and add the carrots to the stockpot. Cook for about 5 minutes, stirring from time to time. 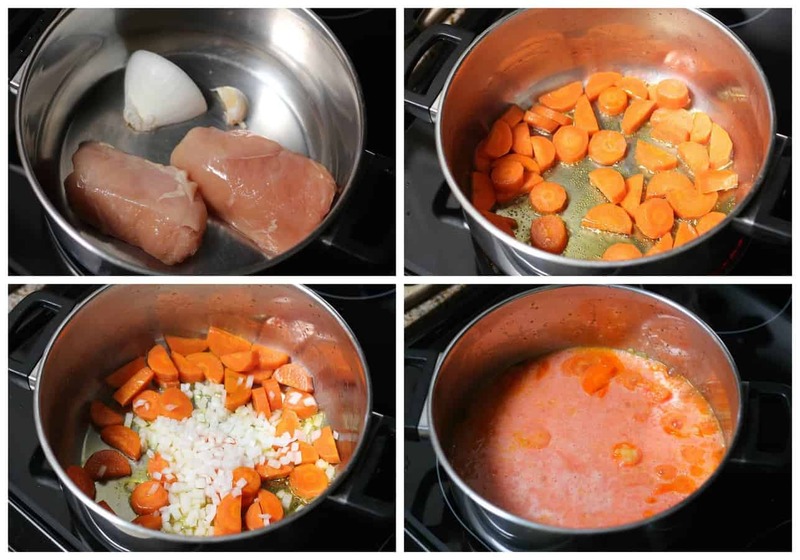 While the carrots are cooking, place the tomatoes and garlic in your blender with one cup of the chicken broth. Process to form a smooth sauce. Set aside. Stir in the chopped onions with the carrots and cook for 2 minutes until they look transparent. After that, pour the tomato sauce in. Keep cooking for 8 more minutes. Add the reserved chicken broth, green beans, chickpeas, epazote, cilantro, and the shredded chicken. Gently simmer for 6 more minutes. Season with salt. To serve, ladle the shredded chicken, vegetables, and broth into bowls. Serve toppings like diced avocado, cheese, and Chipotles in small serving plates. Serve with warm corn tortillas and lime wedges to squeeze over the caldo. What is the salsa in the top photo (next to the queso)? It looks delicious, but it’s not mentioned in the recipe. It is a Chipotle salsa with roasted tomatoes. I hope to post the recipe tomorrow. Love your recipes, had made plenty, and all of them are so easy and delicious. In this recipe, you don’t mention how many tomatoes? It says in the ingredients list 10 oz. tomatoes, about two large tomatoes. Thank you for the recipe. I have been searching for this recipe. I can’t wait to make it. Enjoy this Caldo Tlalpeño. Have fun cooking! I have found dried espozote. How much would be equivalent to 4 leaves? Use only one or two leaves. The flavor somehow is stronger in the drier form. ok. Maybe only a tsp or 2 then. Thank you. Very good, although I increased amounts of garlic, carrots and onion. Will be making it again. Would like to know how much dried epazote would roughly be equivalent to 4 fresh leaves.